Nintendo now has a few different mobiles games available. How did they do in 2018? Sensor Tower provides a closer look in its analysis today. According to Sensor Tower, Nintendo’s mobile offerings generated almost $117 million worldwide in Q4 2018. That’s a 47% rise compared to the same period the year prior. On the whole, Nintendo collected $348 million in 2018, which is an increase of 15% year-over-year. 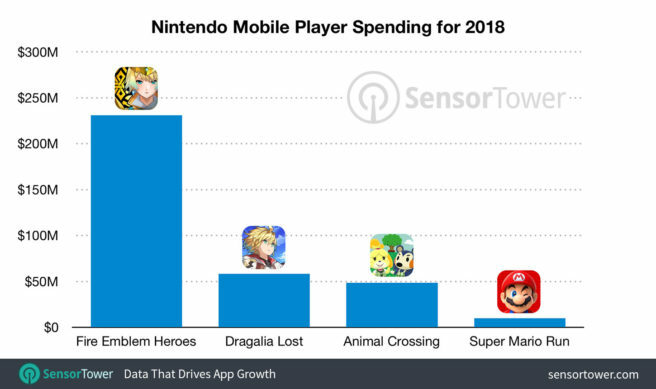 Fire Emblem Heroes accounted for the bulk of Nintendo’s mobile revenue in 2018 at roughly 66%. The game earned $230 million last year and $487 million in total. Draglia Lost was another notable earner having comprised 17% of Nintendo’s mobile revenue last year for $58.4 million. It’s also just reached $60 million and has seen 66% of that come from Japan. One point to note is that Dragalia Lost launched in only five territories in comparison to 40 for Fire Emblem Heroes. As for Animal Crossing: Pocket Camp, that generated another $48.6 million in 2018. Revenue in November came in at $4.5 million, down 44% from the $8.1 million year-over-year. Super Mario Run earned the lowest amount at just over $10 million in 2018. In 2017, it earned $31 million.